Russian President Vladimir Putin signaled that he wanted to help avoid the nuclear apocalypse during his first phone call with President Donald Trump, and Trump reportedly fumbled it—all because he had no idea what the most important treaty between America and Russia was. According to news reports, Putin asked if Trump was willing to extend the New Strategic Arms Reduction Treaty (START), the Obama-era nuclear weapons pact that requires each nation to cap their deployed warheads at 1,500 apiece. It was a golden opportunity for Trump to gauge just how serious Putin truly was in cutting the number of warheads Russia currently has. In October, Putin pulled out of a plutonium disposal treaty because of soured relations with Washington over economic sanctions for invading Ukraine, NATO expansion and disagreements concerning Syria. Now, Putin seemed ready to compromise on the most important treaty between the two nations. It was promising news. In case you haven’t heard, there are around 15,000 nuclear weapons in the world today, with America and Russia possessing 93 percent of them. But you don’t even need 15,000 nukes to destroy the earth. “Most people would be surprised to know that even a very small regional nuclear war on the other side of the planet could disrupt global climate for at least a decade and wipe out the ozone layer for a decade,” study lead author Michael Mills, an atmospheric scientist at the National Center for Atmospheric Research in Colorado, told Live Science. The researchers predicted the resulting firestorms would kick up about 5.5 million tons (5 million metric tons) of black carbon high into the atmosphere. This ash would absorb incoming solar heat, cooling the surface below. The ash that absorbed heat up in the atmosphere would also intensely heat the stratosphere, accelerating chemical reactions that destroy ozone. This would allow much greater amounts of ultraviolet radiation to reach Earth’s surface, with a summertime ultraviolet increase of 30 to 80 percent in the mid-latitudes, posing a threat to human health, agriculture and ecosystems on both land and sea. The models also suggest colder temperatures would reduce global rainfall and other forms of precipitation by up to about 10 percent. This would likely trigger widespread fires in regions such as the Amazon, and it would pump even more smoke into the atmosphere. Basically, even if you were lucky enough not to be in the middle of a regional nuclear shootout, you’d either starve or freeze to death if India and Pakistan said the hell with it and went all out. The original START treaty, signed by George H.W. Bush and Mikhail Gorbachev in 1991, contributed greatly to reducing each nation’s strategic nuclear arsenal by 80 percent. It is the most complex arms control reduction treaty in history. For some historical context, START was signed just as the USSR was on its way to official dissolution in December of that year. It contributes to one of the main reasons so many Russians derided Gorbachev for giving the country to the West. 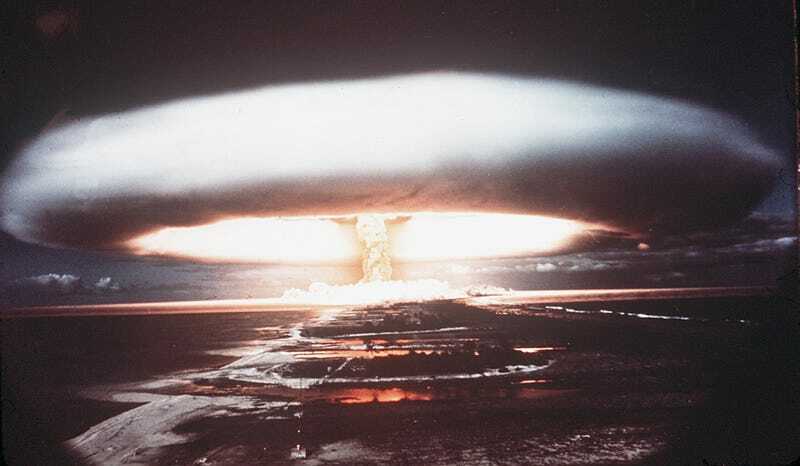 There was a time when there were as many as 70,000 nuclear weapons in the world, with America and Russia holding the vast majority; various nuclear non-proliferation treaties over the decades have helped reduced that number to the 15,000 around the world today. Most of the reductions between Russia and the U.S. took place during the early 1990s. President George H.W. Bush cut the stockpile by nearly 9,500 warheads. In 1992 alone, he cut 5,300 warheads, which is more than any other president ever, according to the Federation of American Scientists; Bush Jr. cut 5,270 during his time in office. That treaty expired in 2009 and New START is its successor. Both sides are required under New START to volunteer the whereabouts of their nuclear arsenals, which can be confirmed by satellite surveillance and on-site inspections. Additionally, Russia and the U.S. must maintain up-to-date databases of every kind of weapon they have and share that information with each other. Jim Walsh, a Senior Research Associate at MIT’s Security Studies Program, told Foxtrot Alpha that New START is vital to keeping tabs on what the Russians are doing with their current nuclear stockpiles. In other words, it is very difficult for either the U.S. or Russia to create new nuclear weapons or deploy more of them from their respective stockpiles without the other party knowing. This is as close to a bilateral checks and balances system between two adversaries as you can get. Without such a treaty, neither side would have the needed foundations to determine if the other party is trying to gain a nuclear edge over the other. New START also empowers both sides with moral capital to convince other nations to shutter their nuclear programs. What better way to persuade India and Pakistan, to pick on them again, to resolve their nuclear conflict than by saying the world’s two nuclear superpowers are slowly reducing their dependence on nukes by showing them a shrinking stockpile and fewer deployed warheads? Graham, a board member at the Center for Arms Control and Non-Proliferation, said another reason to engage Putin on New START is that too often one side believed the other was preparing to launch a nuke at the other and it ended up being a false alarm. Here’s an example: he recalled a time in 1995 when an aide handed former President Boris Yeltsin a briefcase with a screen inside that displayed a warning that a missile was launched from the Norwegian Sea. Under the screen was Russia’s “nuclear football,” the system that allowed Yeltsin to launch attacks around the world with 4,700 nuclear warheads at the ready. After monitoring the missile for four minutes, it ended up being a weather rocket launched to study the aurora borealis. There are hundreds of such incidents in which human error, a computer glitch, miscommunication or some other mistake almost lead to one side thinking the other was going to attack. Today, Russia has an estimated 1,796 warheads deployed, according to the Arms Control Association; America has around 1,367 deployed. Under New START, Russia is also supposed to be fewer than 1,550, which may be why some critics feel the deal is bad. One argument is that Russia hasn’t honored the agreement completely, which is true. Russia does have more weapons deployed than New START permits, but the reasons why that is are far more complicated than Putin simply disrespecting Obama. For starters, Obama negotiated the terms of the treaty in 2010 with former Russian President Dmitry Medvedev, who was nothing more than a placeholder for Putin to run for president again in 2012 because the Russian constitution forbade him from seeking a third consecutive term in 2008. During that time, the EU and NATO were signing more and more former communist states up into their membership and the Czech Republic wanted a defensive missile shield to fend off an attack against Russia, which Putin vehemently protested; the shield was officially sold as a defense against an Iranian missile attack, which Putin didn’t believe. Obama eventually ditched the idea soon after entering the White House. Putin also feared that NATO was expanding closer to its borders, making other negotiations like New START tougher carry out because of Moscow’s own security fears. This is not a setback so much as it is an indicator of the need for the U.S. to work with Putin to relieve his fears of NATO, which is a driving factor behind his current nuclear modernization. Like any negotiation, there are setbacks and challenges, but that doesn’t mean the premise of the brokered deal is flawed. And Trump has never made clear why New START, a deal that is a continuation of a treaty that Bush senior signed into law and first conceived by Ronald Reagan, is a bad deal. It’s in America’s interest to reduce these nukes, and frankly, Putin’s too, which may have been why he raised the point. Putin may be a ruthless autocrat who has no problem stealing sovereign land, in the case of Ukraine, and ruling his nation with an iron fist, but one thing he doesn’t want to be is dead. Even he knows that the possibility of a nuclear war helps no one. Based on the Reuters report, Trump’s only reason for wanting to ditch START is because Obama negotiated it. Negotiating nuclear arms non-proliferation treaties with Russia has never been easy, so when Putin opened the door to discuss it with Trump, the new American president missed a huge opportunity. Walsh, an expert affiliated with the Center for Arms Control and Non-Proliferation, does hold out hope that Trump can recover from this, saying that either side can bring up New START at a later date. But until then, everyone is left to wait on how the world’s top nuclear powers will end up resolving its nuclear weapons differences.